Note that this has since been renamed Dr Oxford’s Experiments and relocated to Oxford Street. You can find out about the new location by reading my review of their second game. It hadn’t started well, but things improved markedly once we’d entered the room. 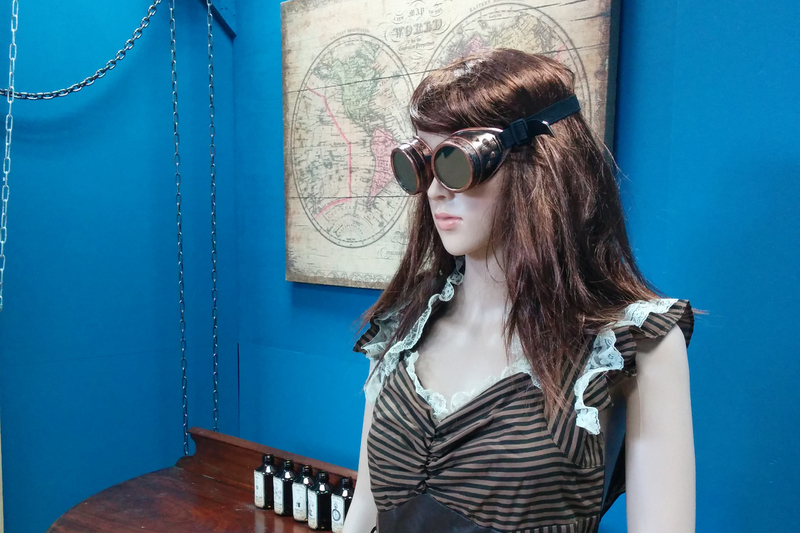 While they haven’t gone to town, there are a variety of props to give the feeling of the 19th Century, and in particular the Steampunk look. For my tastes there are plenty, although your mileage may vary. There were also plenty of puzzles to keep you occupied, most of which were reasonably straightforward (or at least were once you solved them!). I don’t mean that in a negative way – puzzles should be straightforward to solve, at least once you’ve decided how to solve them. There were a couple which required you to do things which we felt might be frowned upon by the host, which is always a bit annoying, so we needed clues to give us the confidence to get past them, but apart from that the puzzles were good. The room had two puzzles which required (or at least strongly encouraged) teamwork. That always makes me like a room more – obviously every room requires a certain degree of teamwork, but when two people make a challenge physically easier, that brings a smile to my face. The climax of the game was, to be honest, a bit of an anticlimax – we solved the last puzzle expecting there to be a little bit more to do, but that was it. The host was suddenly in front of us and it was time to high five and take some photos. We escaped with around fifteen minutes remaining and never felt like we were under pressure. Everyone contributed, but it didn’t seem like we got in each other’s way, which I think was down to a well designed room. A fantastically quirky room. In the end, I even found charm in the amateurishness of the host, the basic nature of the waiting area and the feeling that it had been put together with love for puzzles rather than someone with an eye for business. I definitely wouldn’t say this is a “must do” London room, but it more than holds its own against many of the big London names, and if you’re looking for something slightly quirky, with good puzzles then I’d recommend. There are plenty of food places around, but nothing very exciting in the immediate vicinity. We were about to give up and go home when we chanced upon the Efendi restaurant, which proved to be excellent. The venue now offers two rooms, “Professor Oxford’s Experiments” and “Da Vinci’s Exploration”. I’m guessing neither of those was the room you reviewed? If you look on Escapes Land’s website, you’ll see that Professor Oxford’s experiment is based on this room. They’ve told me there are some minor changes and one new puzzle, so I think it’s pretty close.